With summer not too far away, facial eczema prevention is once again front of mind for many livestock producers. 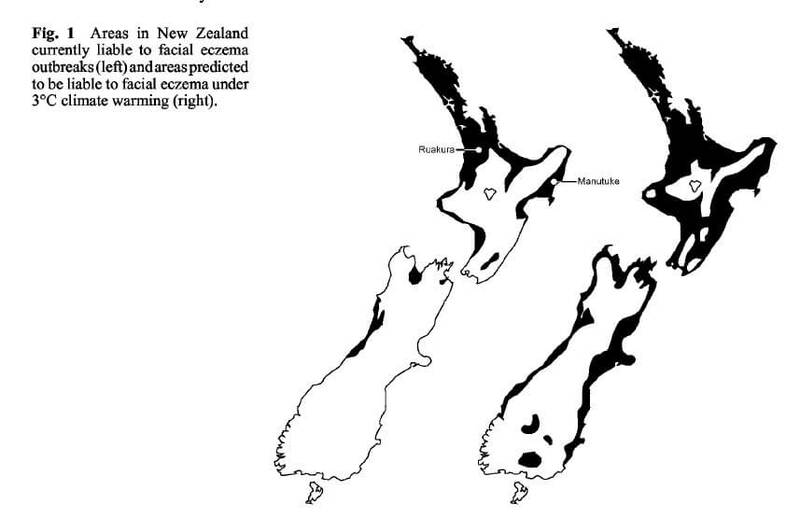 While facial eczema has traditionally been considered a North Island issue with only small areas of the South Island affected, elevated temperatures across the country have led to a wider distribution of facial eczema cases. New Zealand authors (Di Menna et al., 2011) have illustrated this distribution. In the image below, the map on the left shows the areas susceptible to facial eczema outbreaks in 2011, while the map on the right shows the area potentially affected under a 3oC increase in environmental temperature. The warm, moist environmental conditions generally experienced from January through to May support rapid growth of the toxin producing fungus and consequently the levels of toxin present in pasture can increase rapidly over these months. While many animals affected by facial eczema do not show obvious signs, they will inevitably suffer liver damage and reduced wellbeing. In a study carried out by DairyNZ and the Sustainable Farming Fund (2014), researchers showed that as many as one third of farms surveyed during the 2014 facial eczema season had cows affected by sub-clinical facial eczema, although the vast majority of farms had not seen any clinical cases. Other New Zealand work suggests that as many as 50 percent of animals may be affected when as few as 3 percent show skin lesions. Dairy cows affected by even a sub-clinical facial eczema challenge show reduced milk production. Productivity in beef and sheep animals is also reduced, with Beef and Lamb New Zealand estimating a reduction in lifetime performance of up to 25 percent, even when no symptoms are visible. Planning ahead with the early implementation of strategies to minimise the risk of facial eczema is essential if liver damage and the subsequent production losses are to be minimised, as significant damage to the liver occurs prior to the observation of typical skin. Planning your control strategies – whether pasture spraying with fungicide, zinc sulphate treatment of water or zinc oxide addition to feed (or a combination of any of these) – and identifying any potential gaps early on is key to ensuring that cows are fully protected. Regardless of the method of supplementation used, knowing the liveweight of the herd when calculating the expected dose rate is vital, as the recommended daily intake of elemental zinc is 2g per 100kg of liveweight. When done well, supplementing stock with zinc added to feed can be both easy and effective, as the intake of supplementary feed is often more consistent and easier to manage than water intake. NRM offers a range of solutions for producers looking to supplement zinc through the feed. These include MultiFeed + Zinc, a versatile feed ideally suited for feeding to sheep and beef animals in the paddock and are designed to provide 2g of zinc per 200g of feed. Zinc oxide can also be included as an additive in any of the NRM Dairy Feeds or custom blends. Talk to your local Nutrition Specialist or the friendly team at your local Farmlands store for further information about managing facial eczema this season.